I want to start out by mentioning what a weird phenomena Walgreens is. What was once a small chain of run-down buildings here and there has turn into a vast empire of good-looking modern buildings on nearly every street-corner. Walgreens are cropping up like 7-11’s in the 80s. And they’re awesome. Driving home and suddenly realize you need a jug of milk and foot cream. Walgreen’s has it. Have a sudden craving for walnuts and a slinky? Walgreen’s has it. Going on a long trip and want a crossword puzzle book and a neck pillow? Walgreen’s has it. It’s Walmart concentrate and it’s awesome! 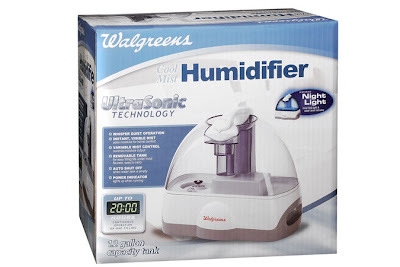 Now a word about humidifiers. I’m a cool-mist guy. I get hot enough at night as it is. I typically only have a sheet over me while I sleep and 90% of the time I end up kicking that off and just lay there in my Empire Strikes Back briefs. So the last thing I need is one of those warm / hot mist humidifiers which makes you feel like you’re sleeping in a sauna. air in the room. Which means you’re stuck with this filter. A filter which is impossible to clean and even though you scrub the tank, and bowl and the filter you just know that there are microbes of fungus and bacteria left behind. And you’re using the humidifier because you’re sick, maybe feverish, a touch delusional so you find yourself imagining all the germs you are willingly inhaling into your already burdened lungs. It’s awful, but your throat hurts so bad and you’re so stuffed up that you dare not fall asleep in all that dry air. So I started getting sick earlier this week, and my wife dug through our closet for our humidifier only to find that the filter was green and something had made it into a nest, and we couldn’t find the tank for it, so ya, it was time to get a new one. So on my way home I stopped to get one. I was going to go to Walmart but decided my tolerance level for stupid people was far too low to risk going there. And besides, I may pass 1 Walmart on the way home, but I pass 23 Walgreens!!! I went in, found their humidifier section and started looking. What I found was a great deal. 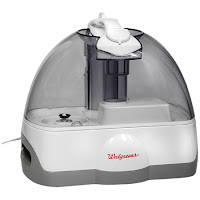 This Walgreen’s brand cool mist humidifier which was regularly $45 was on sale for $35. It also had some claim about “UltraSonic Technology”. But that didn’t concern me too much. I didn’t much care. I was sick, and it was a good price and all that really mattered was it was cool mist instead of warm mist so I bought it. I got home and read the instructions, and it wasn’t until that moment that I realized this humidifier doesn’t use a filter. It uses the wonders of UltraSonic technology to atomize the water. I don’t know if that is actually true or not and it really doesn’t matter. It instantly produces a visible cloud of cool mist. Isn’t that what you want? Actually there are some drawbacks. You have to have this humidifier in an elevated position, on a chair or dresser or something because it doesn’t use a fan and therefore there is no real propulsion system. The mist pumps out the top of the unit and then kind of drifts, and then falls. The net result is the room gets humidified, but the carpet (or anything) directly in front of it gets a little wet. Not “just shampooed the carpets” wet, or "I just peed the floor" wet but just a barely noticeable amount of “hey this isn’t dry right here”. The other problem, I found, is again the fact it doesn’t use a fan, so it’s “whisper quiet” but not silent. You here this none stop “wet” sound. Similar to if you owned a fish tank. 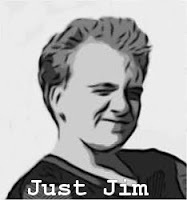 And you also get the occasion bubbling you would get with a water cooler, which can be alarming in the middle of the night. I’ve had dreams every night since I started using this humidifier involving water. Dreams of drowning in my car, white-water rafting and one of peeing my bed which damn near ended up becoming more than just a dream, if you know what I mean. Clean up of the unit is a snap. All I had to do is tell my wife to clean it before I left to work and when I got home, voila, it was clean. But she said it was easy to clean and much better not having to deal with a moldy filter. So there are the downsides I explained but all and all, both my wife and I love it. The Walgreens Cool-Mist Humidifier is a ReviewSpew Certified All-Star!! One of the most hilarious product reviews I have ever read. I just bought this unit at a thrift store for $3.99. Thanks for this product review it was informative and entertaining. I will be sure to place it in a good location where the water sprays won't bother flooring.